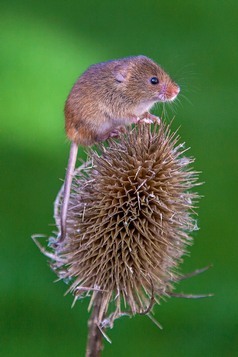 The Harvest Mouse is the only British mammal with a prehensile tail; almost hairless, its tail is as long as its body. Harvest mice usually have two or three litters between late May and October. Most litters are born in August. There are usually around six young in a litter. The young are born blind and hairless but grow extremely quickly and start to explore outside the nest by the 11th day. The young are abandoned after about 16 days, but continue using the nest which may by then start to look rather dilapidated. A fresh nest is built for each litter. Cold wet weather is a major cause of mortality. 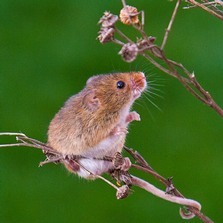 Harvest Mice mainly feed on seeds and berries but will also eat insects. Harvest Mice sometimes take grain from cereal heads but damage to cereal crops seldom happens. They in turn have many predators including Weasels, Stoats, Foxes, cats, owls, hawks and corvids. Harvest Mice are often found in linear habitats with unmanaged reeds and grasses alongside ditches, field edges and road verges, and hedgerows, sometimes in rough grassland but rarely now in cereal crops. Information on the distribution of Harvest Mouse in Barnsley, its conservation and proposed actions can be found via the links below. Harvest Mouse, Micromys minutus is a Priority Species in the UK Biodiversity Action Plan 2007 (UK BAP). The Harvest Mouse is towards the northern limits of its range in Barnsley. 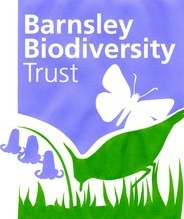 It is a Local Priority Species for Barnsley because of its national status, its general decline and the potential for conservation. 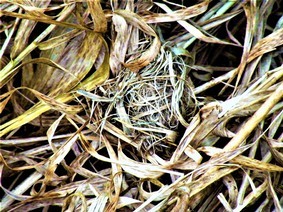 The Harvest Mouse builds spherical nests of tightly woven grass, well above ground in tall grasses. The size of the nest can vary from only 5cm in diameter for non-breeding nests to 10cm in diameter for breeding nests. No other mammal in the UK does this so finding these nests tells us of its presence. It has pale russet orangey fur with a white underside. Its tiny size, blunt nose, small eyes, and small hairy ears distinguish it from other mice Their hearing is acute and they will react sharply, dropping down if you are near.